The first of the potting-on in 2017 has begun with the Courgette Black Beauty seedlings. Their growth has been unequal, with the first plant emerging after just 48hrs. 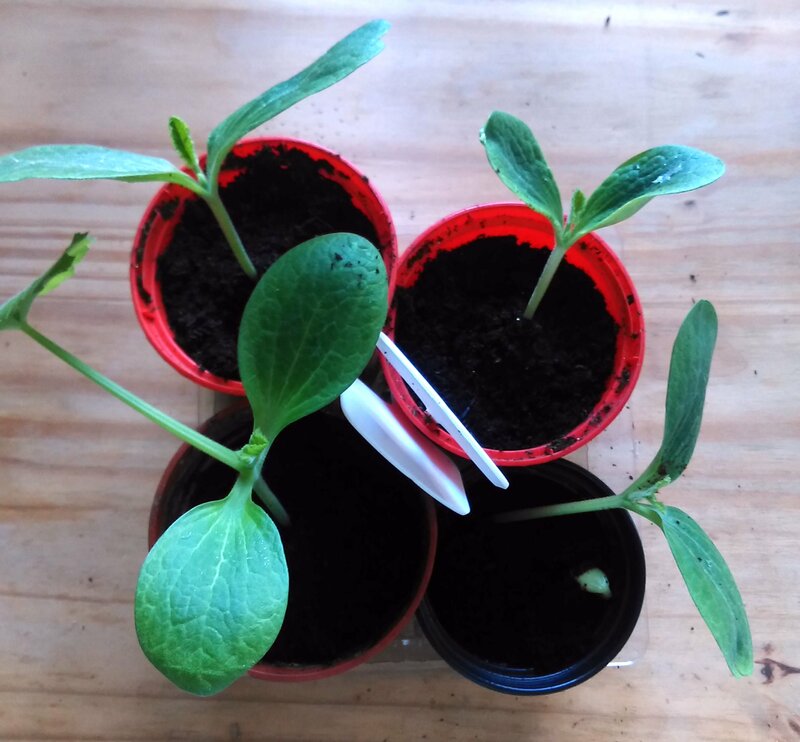 I sowed 3 seeds in each of 2 small pots, and even though they’re using the same compost (John Innes Seed Sowing Compost), and were in the same propagator, and on the same windowsill, while I’ve needed to prick out and pot-on one of the pots where growth has balanced out fairly well, the other pot has one seedling a little behind, and another just breaking the compost. The 6th seedling remains a mystery for now. Taking the pot with the three larger seedlings, I carefully tipped it in the palm of my hand, with the stems and leaves cradled through my fingers and out of my hand. These plants are lush green, rubbery, and very tender and so I don’t want to damage them, therefore as soon as the weight shifted, I counteracted it so that I didn’t end up tipping the pot of compost all over their underside. The plants are healthy, and I’ve now potted them up into their own pots with a multipurpose compost. The 6 Courgette ‘Black Beauty’ seeds were sown on 13th March. They’re all at about 5 different stages. The 5th seed is just breaking through in the bottom right pot. This will be the first of 2 or 3 pot-ons for these, before I can finally plant them out in my new garden. The other pot remains as-is on my windowsill alongside them, waiting for the seedlings to catch up. 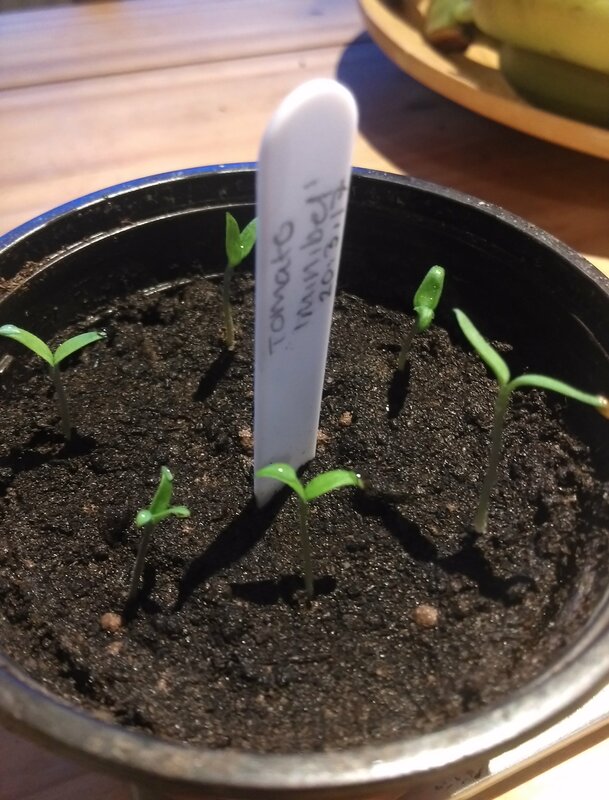 Meanwhile, my Tomato Minibel seeds have germinated within their single-pot dome propagator. This took 10 days, although one seedling was up within about 2 days. According to the packet, it’s now safe to remove the dome and let them enjoy normal temperatures. The Tomato ‘Minibel’ seedlings are up, but can stay there for about a couple more weeks. These seedlings can remain in this pot for about a couple more weeks before I’ll need to pot them on into the safety of their own pots.